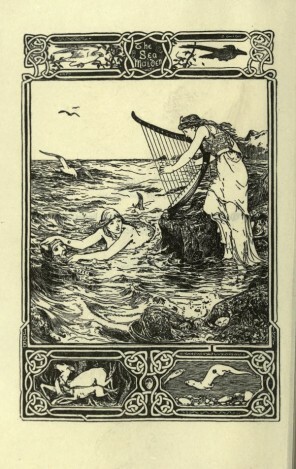 “The sea maiden.” Illustration by John D. Batten from Celtic Folk and Fairy Tales by Joseph Jacobs, publication date unknown. Read Celtic fairy tales from Joseph Jacobs, Andrew Lang and other famous authors. Explore full list of Celtic fairy tales now. About: The Celtic nation has a rich history of folklore, with Celtic folk tales, fairy tales, and mythology that has remained popular for years, largely because of the imaginative and compelling world contained in the legends. The stories are gathered from Celtic individuals that were told over and over through generations, collected by authors such as Joseph Jacobs. Joseph Jacobs was a prolific author and collector of fairy tales, and completed two books of Celtic tales: Celtic Fairy Tales and a follow-up volume, More Celtic Fairy Tales. He was inspired to collect these tales after completing his book English Fairy Tales, and realized that the literary world lacked a true collection of tales of the Celts. His aim was to attract English children to enjoy the tales, as he noted in an essay in the first volume, and also to help preserve them. Andrew Lang, famous for his fairy book series, collected several Celtic fairy tales and folk tales in his volumes as well, with some originating from Scotland, and other stories for children originating from Ireland.